This movie has a lot in common with the other early D.W. Griffith representations of the Civil War, with one big exception: the story is told from the point of view of a Union soldier (Charles West, who wore the opposite uniform in “Swords and Hearts” and “The Fugitive”), rather than a Confederate. The storyline roughly parallels that of The Red Badge of Courage – a young infantryman departs proudly for the war, but when he gets his “Baptism of Fire,” he flees in panic. Shamed by his cowardice, he becomes determined to redeem himself with acts of courage, and winds up saving the day by leading reinforcements and ammunition to his old regiment. Blanche Sweet (from “The Goddess of Sagebrush Gulch” and “The Eternal Mother”) gets a small but important role as his sweetheart – he runs to her home in his initial flight, and she scorns him and prays for his redemption when he returns to the battlefield. Obviously, themes are also present that we saw in “The House with Closed Shutters” and “Swords and Hearts” as well. 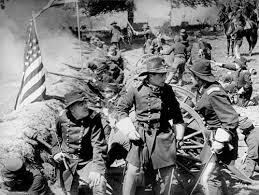 It strikes me that of the many Civil War shorts that Griffith made, this was actually the most elaborate, in terms of staging the battle scenes, and certainly made use of the most actors and extras. He basically rehearses the seizing of trenches as it would be done four years later in “The Birth of a Nation.” The men on horseback riding to the rescue also mimics “Birth,” although Bitzer does not use a moving camera here. Some powerful images include the Confederates emerging from the smoke to invade a trench the heroic dash of the ammunition wagons, and the Rebels lighting fires to halt them, causing at least one to explode. Unfortunately, the slight storyline gets somewhat lost in all this action, and we lose track of Blanche Sweet after the wounded commanding officer requisitions her house as a medical station (had there been more time, I imagine her nursing the wounded and hear the story of her love’s redemption). This is certainly not a bad film, so far as it goes, and the editing and cinematography are at the top of their field for the time, but it winds up sacrificing character for thrills.